Hunting small game can add variety to your hunting experience. Ruffed grouse and woodcock are New Hampshire’s premiere small game species, and there are many other opportunities. Challenge yourself through the winter by hunting snowshoe hare or coyote. There are even hunting seasons for furbearers such as fox, fisher and mink. Enjoy spending more time afield by hunting New Hampshire’s abundant small game. Take a Survey - Win a Gun: Small Game Hunters have two Fish and Game surveys to participate in and possibly win a quality hunting firearm! 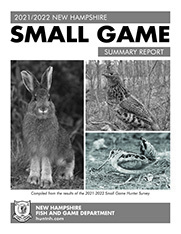 Small Game Survey - Small game hunters can help Fish and Game by providing data on their hunts - find out how to take part. through the annual Small Game Survey. Those who participate are entered into a raffle for a rifle donated by Sturm Ruger Company. Grouse Wing and Tail Survey: By participating in our annual wing and tail survey, ruffed grouse hunters are helping bolster our knowledge of the king of game birds - and are entered into a drawing for a gun donated by the Ruffed Grouse Society.